Embedded in the Official Sanders Campaign Rally at the San Diego Qualcomm Stadium Parking Lot, Sunday … as well as reports and speculation from other real and virtual realms. Everyone and their mother knows that the California Democratic Presidential Primary election is too close to call and totally dependent on voter turnout (duh), which is really unpredictable, although Sanders does have a good field teams. Plus we will use the lines and the time waiting to vote for good things to happen, i.e., petitions to be signed. The guy from the Cape showed up at the rally and gave away the last few 100 of the 4,000 buttons he brought from MA in a suitcase he had to check in at the airport … that weighed just under fifty pounds … of buttons!! 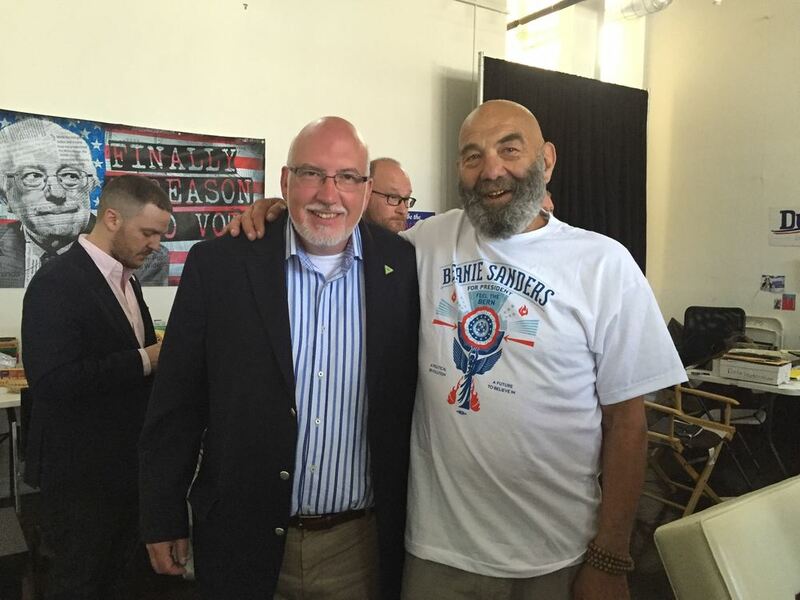 Kudos to Michael Tafe, the productive super canvasser and Bernie Delegate from MA, the man of myth, the outstanding Boston Button Fairie himself. I left after 3 hours … before Berne spoke. Meanwhile, on the East coast, here’s what Elizabeth said about super D’s … http://thehill.com/…/282232-warren-i-dont-believe-in-superd…. I believe that any delegate who pledged for Hillary b4 a certain date … surely b4 Bernie officially declared … or within a month of his declaration … or within some yet to be determined point in time … that delegate is disqualified. The popular vote and the elected delegate vote are for all intents and purposes tied at 50%. Each of these highly EXPERIENCED and perhaps qualified candidates can run on their records, but not their records alone … And their records are each unique. A president’s highest duty is to country, not person. A delegate’s highest duty is to country … to assuring the candidate who will be nominated is likely guided by the desire to provide the greatest good for the greatest number of people. Some believe there is a potentially solid legal challenge to some super D's. We can't give up on Bernie being the nominee until he isn't. And!!! if she who shall not be named is not willing to debate Bernie and discuss openly (again and again if need be), in forum after forum ... 3 times a week every week for an hour ... then she is incapable of leading or representing us. Finally, only Bernie beats trump. Only Bernie can win his own midterm Congress. Only Bernie can break the gridlock. Only Bernie is really a man of the people. The name of the overall movement/coalition is We the People. Embedded with the Sanders Campaign in LA - Saturday June 4. 72 hours until the polls close. The reality of the unreality, the reality of the potential for genuine global, planetary, environmental, social, economic transformation is almost too much to bear, like being high, like being excited, like Christmas morning… only better. I am at HQ for the 9AM canvas. There are at least 100 other people there ready to walk the early Saturday morning LA streets. The first photo is of the crowd getting their assignments. Look at the demographic! As Bernie says … we are doing very well among those under 40. The canvass itself is very hard for this senior. It is hot. No one is home. I walk for hours in a middle class/working class LA neighborhood in Hollywood just on the other side of a freeway. 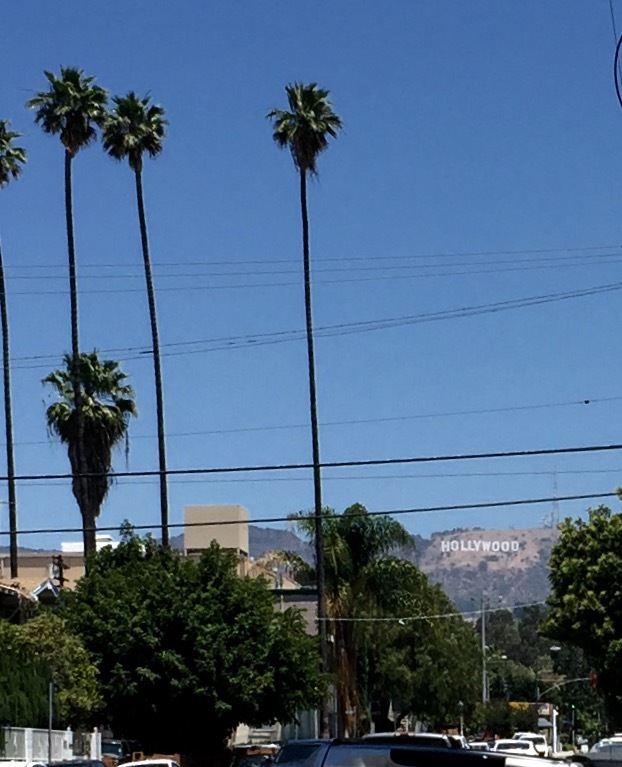 The photo of the Hollywood sign in the distance is my view walking back to HQ. The few people I do talk with seem genuinely supportive, if not also somewhat disinterested. The enthusiasm of the campaign and the campaign workers and the volunteers is quickly dissipated in the reality of the lives being lived in the villages. Back at HQ you see another pic of a typical cross section of volunteers – mostly young, many not “white,” an equal presence of women and men. Many openly gay people. Some gray hairs … but not Cape Cod!! Bernie arrives to gives a very short, real, personal presentation. (That's him, way in the rear of that last photo.) Even if you’ve heard it before it is worth repeating. This is not about percentages. This is the candidate, the man, talking directly to the troops. His family is with him. Grown sons. Grandchildren. This is the campaign leadership reminding his loyal foot soldiers that we are doing this work not just to elect a progressive, compassionate, visionary Jewish son of immigrants to lead the nation, but a movement, a political rEvolution, that we are doing this work in an effort to help one another live fuller, richer, more satisfying lives. That we are doing this work so that the planet we leave our children will be healthy and habitable, that the water from that comes through the faucet will be safe and drinkable, that we won’t be the nation with more people in jail per capita than any other nation on earth. We are being given an opportunity to change the world Bernie tells us. He asks that we do all we can. That we not despair. He reminds us that the battle to win the nomination will continue to the Convention. Bernie says if we have a YUGE voter turnout on Tuesday we shall win and if we do not … and he actually says these words … we shall lose. He thanks the troops. The troops cheer back “Thank you.” The next team of over 100 canvassers heads out the door. There is talk in the air that the rules of the Dem National Committee itself will be turned upon the Party and used to invalidate the delegate standing of certain super Ds who - it will be alleged breached the DNC's own Delegate Selection Rules. I talk with Jeff Weaver about this. (Well “talk” may not exactly be accurate as it implies a back and forth dialog. I talk. Jeff listens.) Maybe I’m not saying anything new. The fight over super delegates WILL be the next battleground … all the way from the last primary on June 14 until a nominee is chosen in Philly. Indeed, at the Massachusetts Dem Convention held this same day in Lowell, MA Senator Elizabeth Warren, no slouch of a political luminary and one of the Party’s most prominent figures speaks critically of her Party’s 'super-delegate' process, going so far as to say super delegates shouldn’t “sway the election." I want to believe that these words mean Elizabeth thinks the supers ought not vote on the first ballot. Wouldn’t that be nice? Bernie’s last words before leaving to his next venue … after saying “thank you” again ... are “onward to victory.” He doesn’t yell the words. He says the words softly, almost under his breath, almost as if to himself. But he is oh so clearly talking to all of us as well. “Onward to victory,” he says. You gotta believe. You also have to call into California. 5500 Hollywood Blvd. Friday June 3. Less than 100 hours until the polls close. At the sad 1 person office on MLK Blvd/South Central LA in the middle of the all Black and Hispanic world – where nothing was going on and the decision not to devote resources there was a rational acknowledgement of voter interest and density. And at the epicenter of Bernie LA– the true Center of Centers … a field HQ operations center, with canvas captains and Susan Sarandon. Where if you complete a 3 hour canvassing shift you get a wrist band letting you into the show. We’re gonna change the world. Sign up for three three hour canvassing shifts over the next three days. This moment in history will not happen again. We did it without big money. Bernie may be here at noon tomorrow. It makes you feel vulnerable to believe again. IT will be a story with a much better ending if we all do three shifts. We are being given an opportunity to change the world. There is an emergence of imagination, of art, of thinking outside the box. Some guy who says he’s in LA from Cape Cod (and alleges he is a delegate from the 9th MA CD and is out here to help win the primary on Tuesday) wants a minute to share a message from the east about gratitude, breadth, the ancestors, and Mother Earth. He approaches the HQ Leader and asks to convene for a collective moment, for one collective breath, for the literal infusion of energy that accompanies acknowledging our common mother and common ancestors. The leader says not now. The visitor from the east creates a much smaller moment in which to receive greetings from the great spirit. To preach the gospel. The choir knows the gospel. The apostles take one breath together … They hold hands and say their names and where they were born and where they are now from and even perhaps a word about themselves. The beads are strung. Every voice is heard. The choir takes a breath together. If you are not in Cali make phone calls. Winning here is important. After years and years of a saying I wanted to change the world and see it freed of unjust power relations, imperialism, greed, environmental denial and lack of respect - I now view a focus on "how we change the world as a whole" to be (a) presumptuous, and (b) a 'practice" error Changing societies and human and interspecies interrelationships and structures takes time, the right conditions, the sharp and blunt forces of evolution, and immense amounts of "doing"/changing behavior and perception. So now I'm just a single issue guy. In this regard I still consider pda - www.pdamerica.org - to offer the finest practical strategy for changing the American political landscape. Yet even there I believe that "activists" must focus on one or two areas they choose to give attention to, rather than saying they are replacing capitalism with socialism, or ending war per se, as examples. Rather we have to target very specific campaigns, i.e., reforming the tax code, protecting fair elections, working for a specific candidate, single payer health care ... think globally, act locally. Besides, while positive transformation is obviously about "politics" it is also about spirituality and the evolution of consciousness..
- the environment, particularly nuclear energy, particularly the evil Pilgrim Nuclear Disease Factory in Plymouth, MA. I am a very active member of the Cape Cod affiliate of Move to Amend - www.movetoamend.com. An article worth reading in regard to big money and the electoral process is - http://www.southernstudies.org/2012/11/did-big-money-really-lose-this-election-hardly.html. And this redrawing of maps reflecting real red/blue distribution in the USA - http://www-personal.umich.edu/~mejn/election/2012/ - is also useful and revealing. Evolving to a ranked voting system would be ideal. Google it. Regarding matters in Israel/Palestine I am an active member of the U.S. Campaign to end the Occupation, http://www.endtheoccupation.org/, and Jewish Voice for Peace, http://jewishvoiceforpeace.org/. The issue of one state/two states in I/P has long been a problem for me. The popular position of those peace and justice organizations i align myself with has traditionally been "agnostic" on the question of one state/two states, believing, and rightly so, that resolution of the conflict in I/P can only be arrived at by the Palestinians and the Israelis themselves, and that we American opponents of the Occupation are limited in our efforts to only the derailing of the Occupation. 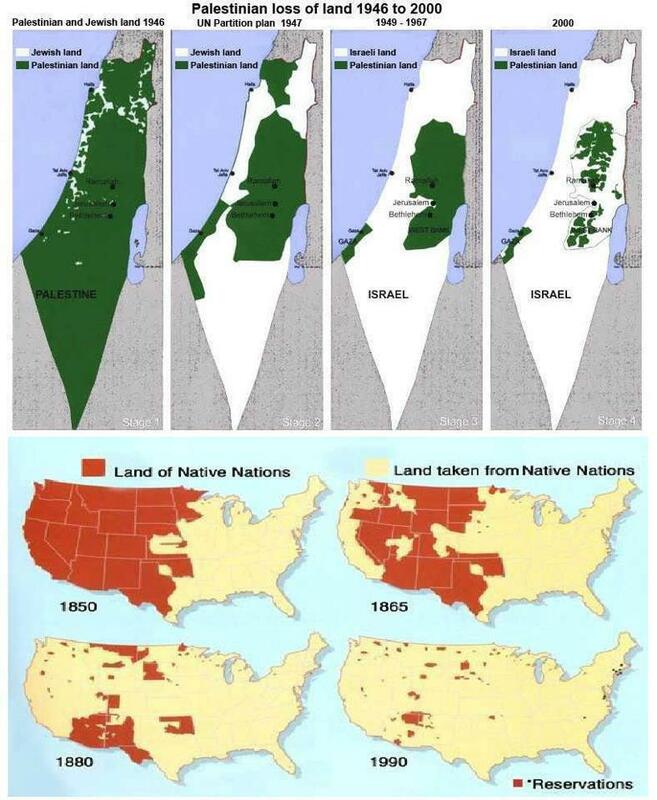 Even when we believed that the "facts on the ground" precluded a just two state solution it was considered politically correct to say we were agnostic, that it was not ours to decide, and that the only legitimate posture we could take was to work for and demand an end to the occ. That has now changed for me for a number of reasons and I believe that the one state solution is the inevitable outcome in I/P, and given that outcome i find it hard to imagine that israel can long remain an apartheid nation. Thus i live with the hope that the remarkable israeli people and the remarkable palestinian people - given each people's common ancestry and often shared history of suffering, compassion, and courage - will in fact find a way to establish a meaningful joint state, protective of the interests of both people in honoring their humane traditions, in an atmosphere of mutual respect, and the understanding that what is good for one is good for all and that israelis will acknowledge the nakba - much as Palestinians have come to acknowledge the holocaust - and will allow the right of return, and the sharing of Jerusalem as the nations capital. The Jewish-dominant state must fall ... as well it should. Palestinians and Israelis - united in their search for security and social and economic justiuce and prosperity - will become a beacon to the world and the middle east for modernity, equality, women's liberation, environmental sharing and respect, economic power not rooted in oil. i look forward to the future and it will be good. . Finally, I am of the view that the intended and unintended genocide of the indigenous populations in the western hemisphere has failed and that the wisdom and perspective of native peoples lives on. Needless to say, this is a good thing, because we humans must remember that we belong to mother Earth and not the other way around.